Now that you've put your property on the market, the photos have been taken, your brochure prepared and your listing is live on the property portals and your estate agent’s website, you'll want to make sure that every viewing has the greatest chance of drawing an offer from potential buyers. Preparing your property for viewings is different to preparing it for photographs - no longer can you simply hide things behind the camera; now it's all about creating an atmosphere that gives people the sense of walking around their next home. So try out our 10 Top Tips on preparing your property for viewings and see what a difference they make. Silence isn't necessarily golden, and having some low level and melodious background music (think Dean Martin, Rumer, classical or non-experimental jazz) can help to fill a house that's empty of people and create a warm and welcoming atmosphere. There is plenty of evidence that pleasant aromas create inviting, homely smells. There are the old adages of roasting coffee and baking (not burning!) bread which are completely true, while bathrooms can benefit from Rituals or Jo Malonereed diffusers. Conversely, boiled cabbage, days old litter trays and musty laundry are never welcome smells! Unless you have extremely docile, quiet and ambivalent pets, it’s best that they are not around. Dogs are lovely but not everyone's cup of tea, and if you have overly excitable animals or ones that bark when visitors arrive, that can put a buyer on edge. Take your pets for a walk, or move them to a neighbour’s or friend's for the duration of the viewing. Usually speaking, it's best not to be around on someone's first visit – leave it to the agent. However, if that's not possible, make sure that whoever is there is not a distraction. If you work from home, go about your business. If you're at home with children, playing with them is great in a way that is not an obstruction to people moving around. So play at a table, or in the garden, rather than in the middle of the living room floor. Piles or sinks of washing up are a definite no-no. If you've got a dishwasher, hide any dishes in there. If the dishwasher is staying, perhaps use the rinse hold function when you go out to ensure that anyone checking their potentially future appliance isn't faced with a gruesome sight. No dishwasher? Wash up the night before and put things away so you only need to deal with breakfast stuff in the morning rush. Leaving laundry lying around the house isn't great. Definitely have - and use - a laundry basket to help keep things tidy. In fact consider giving every used bedroom its own laundry basket. For drying clothes, find somewhere practical to hang them on a rack that is not spatially invasive. Avoid leaving clothing on radiators as it's both unsightly and causes a musty air. Keep all curtains and blinds open for any possible arrivals so the house is as bright as can be and feels lived in and loved. Making people standing around in darkened rooms in the middle of the day while the estate agent fumbles for the light switch doesn’t create the best first impression. If you have a drive or any form of off street parking, leave a space free so your viewer can park easily, rather than having to drive around the neighbourhood looking for a parking space. Give them the sense of already coming home when they arrive at your property. It's really no problem to have evidence that children exist at your home and it's completely acceptable to have toys on display. However, they shouldn't form a barrier to free movement so it's good to have a decent size box on hand where they can quickly be tidied. Avoid piles of letters, leaflets, envelopes, tickets, receipts and whatnot. There's a great piece of advice about handling every piece of paper once, but an alternative is to buy a home filing system where you can keep any paperwork until you deal with it. Have these pointers helped you present your property for sale or for rent to a higher standard? 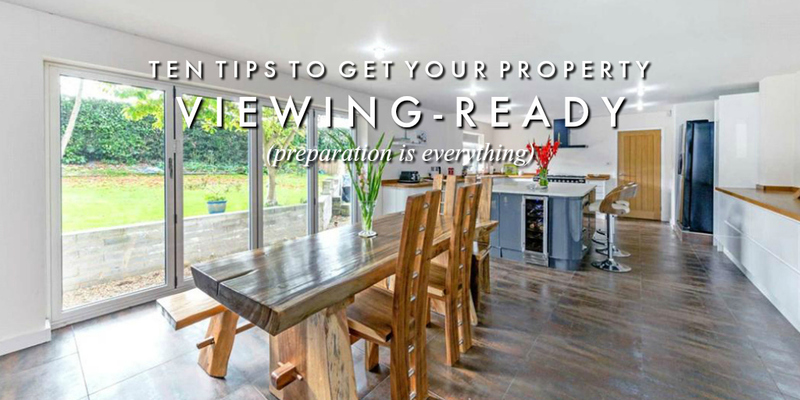 Do you have any more suggestions on how to prepare your home for viewings? Do let us know your thoughts, and remember to get in touch if you'd like any advice around selling or renting your property.